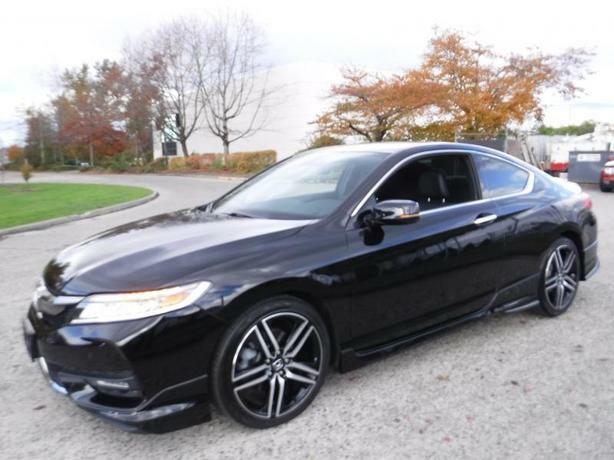 2016 Honda Accord EX-L Touring V6 Coupe, 3.5L, 6 cylinder, 2 door, automatic, FWD, 4-Wheel ABS, cruise control, AM/FM radio, air conditioning, power door locks, power windows, power mirrors, navigation, black exterior, black interior, leather, paddle shifters, steering wheel controls, bluetooth, push to start, traction control, lane change assist, parking sensors, heated seats, power sunroof, power seats, memory seats, backup camera. (Vehicle is currently OFFSITE and will require approximately 1 hour to arrange viewing). $24,810.00 plus $300 conveyance fee, $25,110.00 total payment obligation before taxes. Listing Report, Warranty, Contract Commitment Cancellation option on Fully Completed Contracts, Financing Available on Approved Credit (some limitations and exceptions may apply). All above specifications and information is considered to be accurate but is not guaranteed. Call 604-522-REPO(7376) to confirm listing availability.